The FLIR GF335 is a mobile high-sensitivity, low noise, cooled thermal camera designed for detecting faint heat signatures in a range of applications, including use on test ranges, non-destructive testing, research, and science applications. This broadband camera features a cooled 3 – 5 µm InSb detector producing razor sharp images at 76,800 (320 x 240) pixels. The GF335 records information to the SD card for playback and analysis from the LCD screen, or is transferred to a PC running FLIR ResearchIR. This camera also has a versatile focus options with up to 8x digital zoom. 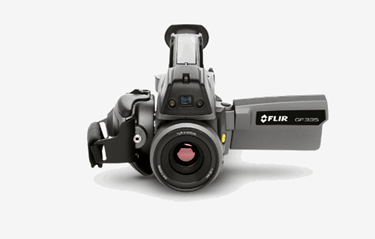 For more features and specifications on the FLIR GF335, visit the webpage.